We would like to extend our overwhelming thanks to ICSOM for the support you have shown us since Orchestra London Canada (OLC) closed its doors in mid-December of last year. Without your financial support we would have been unable to present any performances since the OLC insolvency. In mid-December a major donation to OLC fell through, leaving the organization unable to meet payroll. This led to the administrative office locking its doors, the resignation of the Executive Director and the cancellation of all future concerts to which members of the public had purchased tickets. The OLC staff and all 45 musicians immediately lost their jobs. The board went to the city council to request a cash infusion but this was declined and the orchestra became insolvent. Part of the board’s financial request was to fund the bankruptcy of the organization as well as to pay administrative and musician salaries that had not been paid since November 22. The musicians, however, decided we had a commitment to our subscribers and the community and we would play on. We set about establishing a social media presence, as The Musicians of Orchestra London, on Facebook, Twitter and WordPress. We began performing a series of ‘pop-up’ concerts throughout the city. 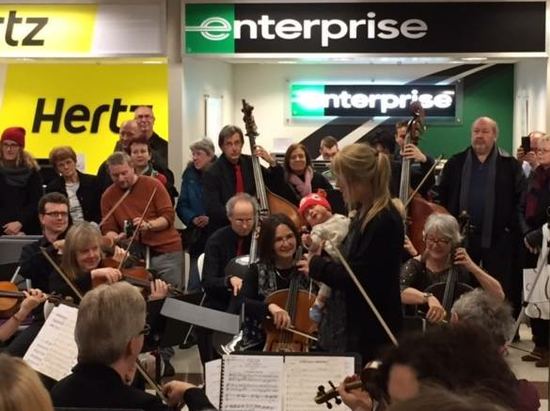 Many of these were chamber music performances in libraries, shopping malls, etc., but the highlight was a full orchestra pop-up we performed on December 22 by the baggage carousel at the arrivals level of London International Airport. At this concert we invited members of the ‘audience’ to step up and conduct us in a selection of Christmas classics. The concert immediately garnered the attention of all our local media and we instantly had the support of a large segment of our community. As a group, we decided we must honour the ticket holders who had been left with tickets for the season that was now cancelled. We went on to perform a Masterworks concert in January to a capacity crowd of 1400—including the mayor and many members of city council. OLC ticket holders were able to redeem their cancelled tickets for this concert and also for a large orchestra pops concert that we performed in February. The community was extremely generous and the venues for these concerts were donated to us. We performed another two classical concerts during the spring and in March began to pay the musicians a modest per-service fee based on a credit system. However, by early June we realised we were unable to continue to pay ourselves, as we now had to pay rent for the venues in which we were performing. Since June we have again performed for no pay. There have been a number of challenges we have faced since deciding we would play on. We lost our charitable status and all our funding from the city, the Canada Council for the Arts and the Ontario Arts Council. With no budget and no access to the OLC databases we have relied solely on social media and the media for all our marketing and communications. The local media, who had, historically, been hostile to OLC, have been very generous with positive coverage of our events and we have worked hard to foster a good relationship with all media. Our Facebook page currently has 4,269 likes (600 likes on our post from 2 days ago!) despite only being created in December. Our current name #WePlayOn arose spontaneously from tweeting that hashtag in every outgoing tweet. The local media caught on to the name and it has stuck—for the time being… Since the bankruptcy we have tried to stay away from the name Orchestra London as much as possible, as the negative association with the collapse of the organization is still fresh in the minds of the citizens of London, Ontario. Concert logistics have proved challenging. As we do not have access to the stands and chairs, we now take our own stands to concerts and do all the stage management ourselves. We have played in a number of outdoor summer festivals in London. Ironically, this is something we have never been able to do before, due to the terms of our master agreement. We have had positive support at every outdoor event we have played, and being out in the community is something we must do to continue to keep ourselves visible as a professional orchestra, as we move into the next stage of our evolution. We have planned a modest season for the fall and winter, with a number of innovative programming ideas and with some unusual partners. In order to present concerts we need to launch a major fund-raising campaign. We have, just in the last few weeks, begun the process of incorporation and re-branding. We are aware we must have a new name and have sought the help of a marketing company to help in the process of positioning and branding. All of this will come at some financial cost, however. In June, Orchestras Canada invited us to present our story at its national conference in Vancouver. Following the #WePlayOn presentation the Canada Council for the Arts told us they would make an exception in our case, and allow us to apply for funding without having to wait the mandatory three years which is their rule for an organization that has become insolvent. We are very grateful for this opportunity and are about to start our grant applications. The London Arts Council has, recently, been able to offer charitable tax receipts to donors wishing to donate $200 or more to #WePlayOn. It is difficult to express the emotional impact the last eight months have had on us. In many ways it has been like a death and everyone is going through the stages of grieving. The financial and emotional impact of losing one’s job so suddenly, and at such an unfortunate time of year, is really beginning to have serious ramifications for us. Amazingly, we have not lost any of our members, with the exception of one violinist who has taken a year’s position in Symphony Nova Scotia. Our musicians feel a deep commitment to our community but it is becoming increasingly difficult to continue to operate with little to no budget. Musicians have taken on all the administrative duties and we are trying to work very much within the framework of a collaborative model. It is amazing how many hidden talents come to the fore when a crisis such as this occurs. In fact the violas had just been waiting for this opportunity so they could finally exert their authority………! Seriously though, we have been overwhelmed by the way in which people, such as you, have so generously offered money, time and expertise. All of the summer festival concerts at which we performed included musicians from outside our community who donated their time to come and play with us. We are, of course, uncertain what the future holds, but it is our intent to use this crisis as an incredible opportunity to do what we do best. The #WePlayOn musicians are dedicated to sharing the transformative and magical power of live orchestral music with the citizens of our community. We are committed to demonstrating that what we do is relevant—even in 2015. Michelle Obama in a recent speech to Oberlin graduands urged the students to: “ …run to, and not away from the noise. Actively seek out the most contentious, polarized, gridlocked places you can find. Because, so often throughout history, those have been the places where progress really happens—where minds are changed and lives are transformed.” And that is what we plan on doing—we are running towards the noise.